In today's busy world, cooking a meal completely from scratch may be difficult. 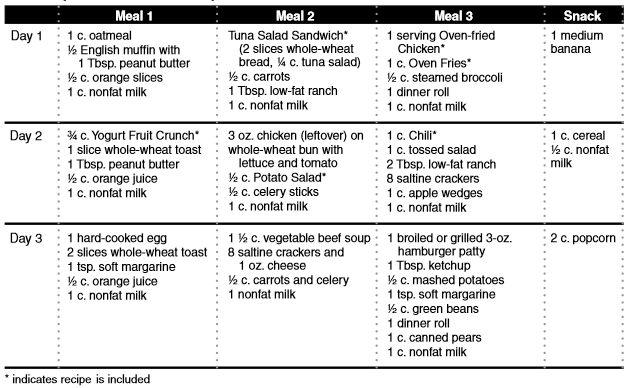 However, convenience foods usually cost more and may be higher in calories, fat and sodium. This is the fifth in a series of publications to help you eat well but spend less at the grocery store. It includes time-money-saving tips and sample menus with recipes that you can adapt to meet your family's tastes. 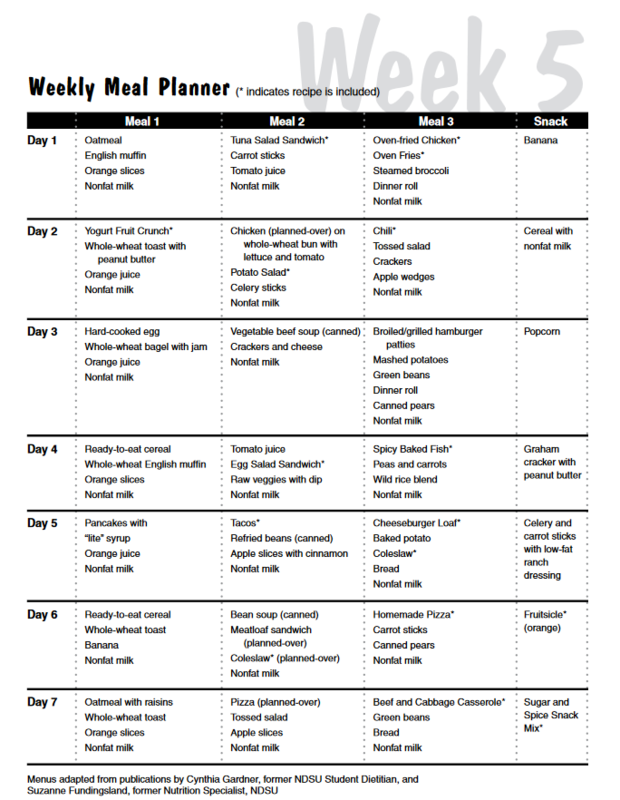 I plan menus and write grocery lists, so I have meal ideas and the food I need. I sometimes prepare portions of a meal in advance. I sometimes use leftovers as the basis for another meal. Other people in my household help with meal preparation and cleanup. I focus preparation efforts on one portion of the meal. For example, if the main course is time-consuming, I fix a simple vegetable or salad. I assemble equipment, cooking utensils and ingredients before I begin meal preparation. I use time-saving equipment, such as slow cookers and microwave ovens. I use the one-pot method. For example, I add vegetables to pasta that is cooking. Think about the items you marked and the ones you did not mark. These are time-saving strategies, and some may work for you. This is the fifth in a series of publications to help you eat well but spend less at the grocery store. It includes time/money-saving tips and sample menus with recipes that you can adapt to meet your family’s tastes. 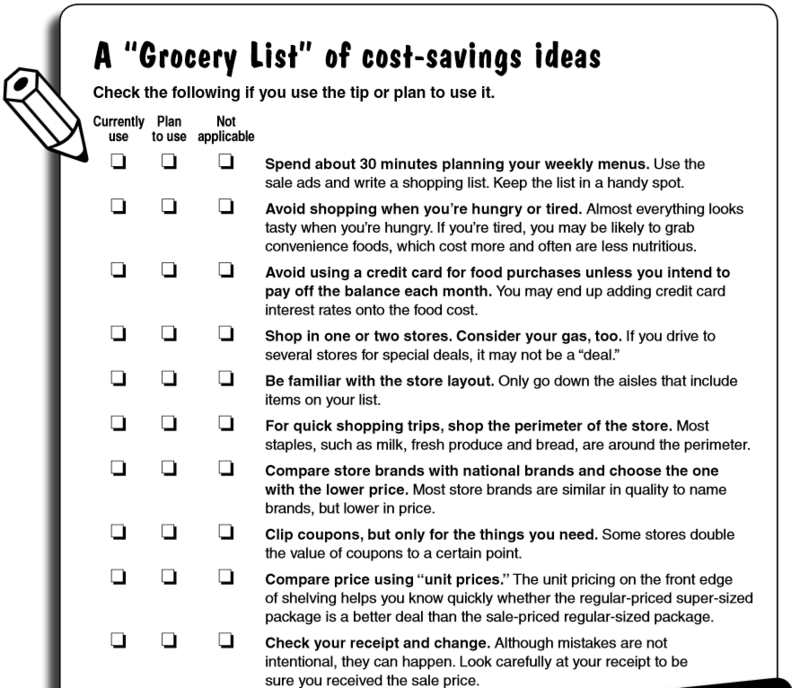 Meal planning and advance food preparation can save you time and money. Find a block of time when you can make a few recipes at once and then freeze them for a later date. Invite your family to help. When you’re in a time crunch, allow the dish to thaw in the refrigerator for the day. Reheat in a microwave, add a side salad and dinner is ready. Example 2: Use a slow cooker to simmer your evening meal to perfection while you are at work or busy doing other things. Mix planned-over beef or chicken, vegetables and broth in your slow cooker before you leave in morning; set on low. Serve with bread, crackers and fruit for a hearty evening meal. • When eating out, take advantage of “two for one” deals, coupons or “kids eat free” specials. • Drink water instead of ordering soda pop. • Share a meal, or have an appetizer as your main course. • Order a kid’s combo when possible. 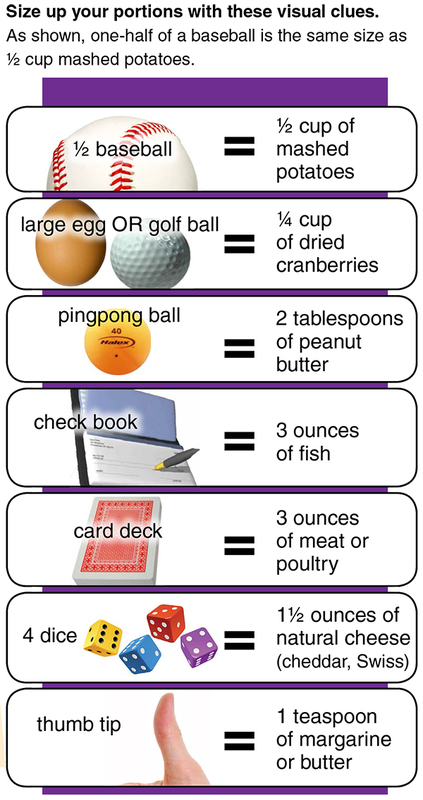 Often the “kid-sized meal” has the accurate portion size for adults. • If the portions are large, ask for a “to go” box early. Put half of your meal in the box and enjoy the rest for lunch the next day. This practice cuts calories, and it provides a second meal for you. You can find the latest nutrition recommendations . Each person has different needs based on gender, age and level of physical activity. 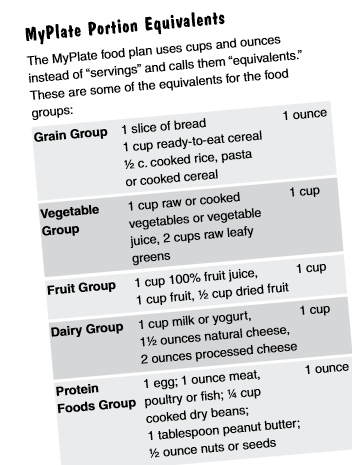 Learn what each of your family members needs at his or her particular calorie levels by visiting the website or contacting your local Extension agent for “MyPlate Plans” handouts for different age groups. Some foods prepared with less fat are considered a healthier option when eating out. Try to choose items that are baked, broiled, grilled, roasted, poached, steamed or blackened. Limit fried, braised, basted, creamed, scalloped, au-gratin, sautéed or stuffed and any foods marinated in oil. For a healthful twist on restaurant-style foods, try the recipes for “Oven Fries” and “Crispy Baked Chicken” included in this publication. If you bring food along, be sure to keep perishable foods, such as meat sandwiches, milk and cut-up fruit, cold. Use insulated lunch boxes and bags with frozen gel packs or frozen juice boxes. Cut the chicken into serving-sized pieces and take off the skin. Heat the oven to 425 degrees. Melt the margarine in the baking dish in the oven. Mix the Master Mix, paprika, salt and pepper in the plastic bag. Add the chicken pieces and shake. Put the chicken in the baking dish. Bake for 35 minutes, then turn the chicken over and bake 15 minutes more (50 minutes total). Serves six. Per serving: 340 calories, 9 g fat, 52 g protein, 9 g carbohydrate, 0 g fiber and 480 mg sodium. Thaw frozen fish in the refrigerator. Cut fish into six servings. Oil baking dish and spread fish in dish. Bake fish in 350-degree oven for 20 minutes. While fish is baking, chop the onion and green pepper. Cook the onion and green pepper in a small pan in a little water for three minutes. Add tomatoes and spices. Cook on stovetop for 10 minutes to blend flavors. When fish is done, pour liquid off. Pour vegetable sauce over fish. Bake 10 minutes. Grate cheese and put over fish. Bake two or three minutes to melt cheese. Serves six. Per serving: 150 calories, 7 g fat, 18 g protein, 3 g carbohydrate, 1 g fiber and 250 mg sodium. Drain fruit if using canned fruit or cut up the fresh fruit. Mix the yogurt and fruit together in a mixing bowl. Spoon the mixture into small serving dishes. Sprinkle ¼ cup cereal on top of each serving. Serves four. Per serving: 170 calories, 1.5 g fat, 7 g protein, 33 g carbohydrate, 1 g fiber and 135 mg sodium. Brown ground turkey or beef in a frying pan. Drain fat. Add the other ingredients, plus 2 cups water. Cook at a low heat for 10 minutes or until the macaroni is cooked and all the liquid is gone. Serves six. Per serving: 360 calories, 7 g fat, 26 g protein, 4 g carbohydrate, 6 g fiber and 790 mg sodium. 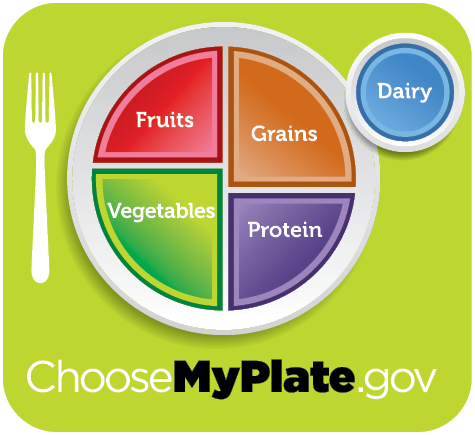 Developed by the dietetic students at the College of St. Benedict and St. John’s University, Minnesota. Measure flour, baking powder, salt, cream of tartar, sugar and dry milk into mixing bowl. Stir with a spoon to mix well. Measure and add oil. Blend the oil into the dry mix using the pastry blender, the fork or the knives. The mix should look like coarse cornmeal. Store the mix in covered plastic or glass storage containers in the refrigerator. To use the Master Mix in a recipe, stir the mix in the container, then spoon it carefully into a cup and level it off with a knife. Makes 11 cups. Use in recipes similar to commercial baking mix. Heat oven to 450 degrees. Spray with nonstick cooking spray or lightly oil cookie sheet. Brown the ground beef in the frying pan and drain the fat. Add oregano and mix well. Let sit. Measure Master Mix and milk into a bowl. Mix lightly to make a dough. Spread flour on the counter. Dump dough onto flour and knead six times. Pat half of dough to fit size of cookie or pizza pan. Move dough to lightly oiled cookie sheet. Pinch the edges of the dough to make a rim. Spread pizza sauce on the dough. Cover with half the ground beef, assorted toppings and grated cheese. Bake at 450 degrees for 15 or 20 minutes. Repeat with second half of dough. Serves eight. Per serving: 230 calories, 8 g fat, 12 g protein, 26 g carbohydrate, 0 g fiber and 630 mg sodium. Note: This recipe makes two pizzas, so you will have “planned-overs” for lunch, too. Put eggs in pan. Cover with cold water. Put pan on the stove and heat until the water starts to boil. Take pan of eggs off the stove, cover the pan and let it stand for 15 minutes. Wash and chop the celery and put in small bowl. When eggs have stood for 15 minutes, pour cold water over them. Take out of water and peel the eggs. Cut eggs on cutting board and put in bowl. Measure and add mayonnaise and mix well. Place four slices of bread on cutting board. Put one-quarter of egg mix on each slice. Spread egg mix over bread, top with tomato slices and lettuce, and put another slice of bread on top. Cut sandwiches in half and serve. Brown meat in the frying pan and pour off the fat. Chop onion and add to meat. Add pepper and chili powder and mix well. Slice about one-half a head of cabbage into thin strips. Place half of the cooked ground beef in the bottom of a casserole dish. Spoon half the uncooked rice and half the cabbage over the meat. Repeat the meat, rice and cabbage layers. Mix the soup and water in a bowl. Pour soup over the top of the casserole. Cover and bake for one hour at 350 degrees. Serves four. Per serving: 220 calories, 3.5 g fat, 16 g protein, 33 g carbohydrate, 5 g fiber and 310 mg sodium. Preheat oven to 325 F. In a large plastic bag with a tight seal, combine oat squares and pretzels. In a small bowl, stir together melted margarine, brown sugar and cinnamon. Pour over cereal mixture. Seal bag and gently shake mixture until well coated. Transfer to a baking sheet. Bake, uncovered, for 25 minutes, stirring once or twice. Spread mixture onto paper towels to cool. Add dried fruit and stir to mix. Store at room temperature for up to two weeks. Serves 14. Per serving: 140 calories, 2.5 g fat, 2 g protein, 27 g carbohydrate, 1 g fiber and 250 mg sodium. Wash potatoes, but don’t peel. Slice into ½-inch-thick strips. Blot dry with paper towels; toss potatoes with oil in a bowl until coated. Sprinkle with paprika if desired. Spread on baking sheet and bake at 425 degrees for 20 to 25 minutes. Toss with Parmesan cheese (optional). Serves eight. Per serving: 100 calories, 2 g fat, 2 g protein, 18 g carbohydrate, 2 g fiber and 10 mg sodium. Chop the onion. Brown the ground beef and onion in a large frying pan. Pour off the fat. Stir in the rest of the food. Heat for 10 minutes and serve. Serves four. Per serving: 230 calories, 3.5 g fat, 20 g protein, 30 g carbohydrate, 8 g fiber and 540 mg sodium. Chop onion. Brown onion and ground beef in frying pan. Pour off the fat. Drain one can beans and mash with a fork or potato masher, or blend in a blender. Drain other can of beans and add it and mashed beans to ground beef. Mix well. Fill warm, soft tortillas with ground beef and beans, grated cheese, lettuce and tomatoes. Serve with salsa. Serves four. Per serving: 460 calories, 13 g fat, 29 g protein, 58 g carbohydrate, 8 g fiber and 820 mg sodium. Open tuna can and drain tuna. Put tuna in small bowl. Wash and chop celery on cutting board. Measure ¼ cup mayonnaise. Add celery and mayonnaise to tuna in bowl. Mix well. Place four slices of bread on cutting board. Put one-quarter of tuna mix on each slice. Spread tuna over bread and put another slice of bread on top. Cut sandwiches in half and serve. Serves four. Per serving: 190 calories, 2 g fat, 16 g protein, 30 g carbohydrate, 0 g fiber and 450 mg sodium. Beat egg in mixing bowl. Add milk and bread pieces and let soak a few minutes. Chop onion and grate cheese. Add to mixing bowl. Mix in ground beef. Shape into a loaf and put in baking dish. Bake at 350 degrees for one hour. Serves seven. Per serving: 160 calories, 8 g fat, 15 g protein, 5 g carbohydrate, 0 g fiber and 180 mg sodium. Quick tip: Buying a block of cheese and grating your own can save you money. Compare the unit prices of block cheese and grated cheese. Wash, scrub and peel potatoes. Cut into ½-inch cubes. Put potatoes in covered pan in 1 inch of water and cook until potatoes are tender (10 to 15 minutes). Put the two eggs in another pan and cover with 1 inch of cold water. Bring to a boil on the stove, remove from the burner and let sit for 10 minutes. Mix all the other ingredients together in a mixing bowl. When eggs are cooked, peel and cut them. Drain potatoes. Add eggs and potatoes to everything in the mixing bowl. Mix well. Refrigerate two hours or overnight to let flavors blend. Serves four. Per serving: 360 calories, 3 g fat, 11 g protein, 74 g carbohydrate, 7 g fiber and 740 mg sodium. Pour juice into the paper cups. Add a Popsicle stick or plastic spoon. The stick can be at an angle. Put filled cups in freezer to freeze juice. Tear off paper cup when you are ready to eat the fruitsicle. Per fruitsicle: 60 calories, 0 g fat, 0 g protein, 15 g carbohydrate, 0 g fiber and 0 mg sodium.